Protein-rich Pumpkin seeds should be the wise choice for vegans who depend on plant-based proteins. 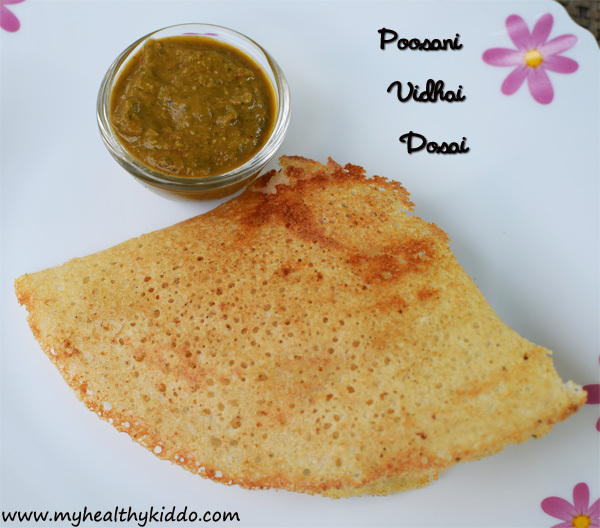 Dosa is an all-time favourite for all ages. 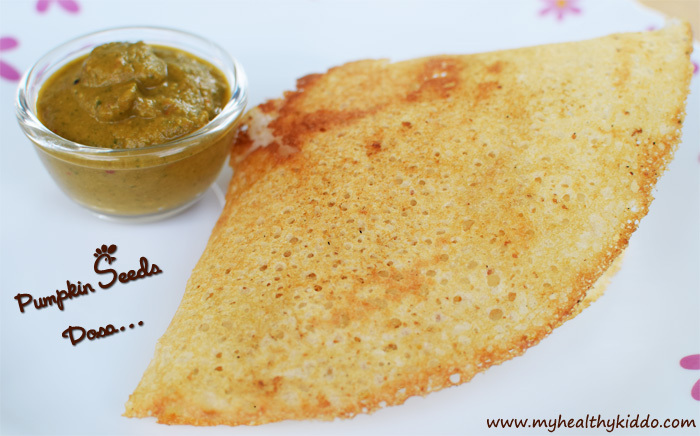 Would you deny if a healthy stuff is sneaked inside dosa without compromising the taste ??!! 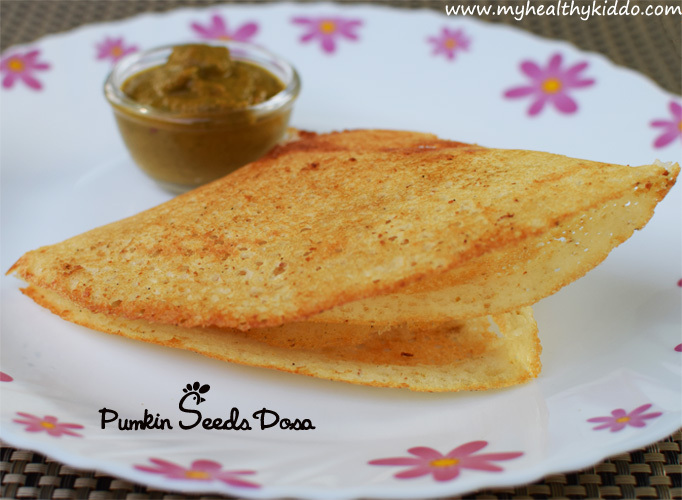 Just toss in some pumpkin seeds or flax seeds powder to the batter and make your dosa/idli. Opt for home-made pumpkin seeds powder. If you could not afford time to make at home, get store bought unshelled whole seeds and grind to powder in mixie. Considering the nutritional benefits offered by pumpkin seeds, it is a must for dads and moms to be. Women shall continue during pregnancy, lactation and for the whole life. You shall give for babies from 1 year. This is a healthy family food to be consumed by all – from toddlers to thata-paati(grand parents). 1. Add Pumpkin seeds powder to dosa batter. 2. Mix thoroughly. Heat and grease oil in dosa tawa with onion. Take batter in a wide-bottomed ladle and spread outwards from center in dosa tawa. 3. If required, drizzle some oil around dosa. Once browned, turn to other side and wait for 2 mins. Crispy Pumpkin seeds dosa is ready! Serve hot with chutney or podi. I have given my usual ratio of batter ingredients. You shall use your own. Good practice is to mix the powder just before making dosa. Left-over mixed batter can be refrigerated and used within a day. To make pumpkin seeds chapathi, just add Pumpkin seeds powder to chapathi flour before adding water. 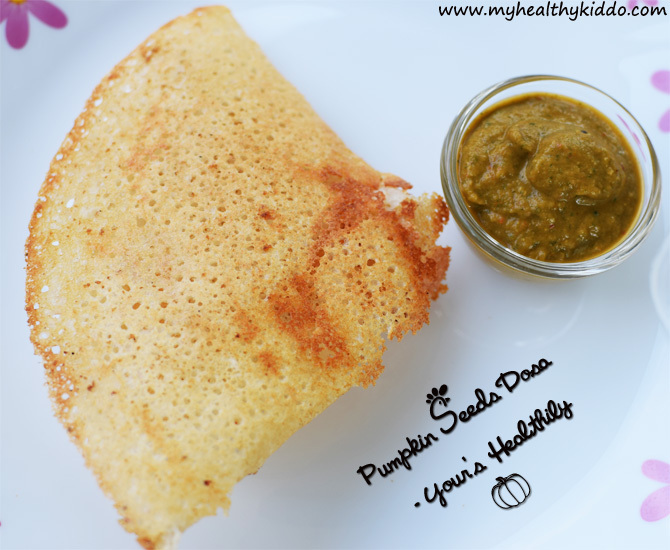 Just add Pumpkin seeds powder to any batter/flour and make healthy idiyappam, aappam, paniyaram, adai, murukku, cookies, muffins ,… the list is endless! Flax seeds powder can also be used in the same way. Flax seeds are available in supermarkets. Pumpkin seeds – Magnesium, Copper, Zinc, Folates, Omega-3 fatty acids, Iron, Vitamins E & B, Proteins and Fiber.